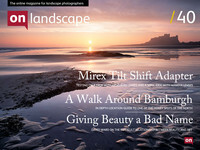 It was On Landscape holiday recently and being of a productive bent I thought I could combine a couple of nice walks in Bamburgh (for that is where our brief respite took place) with the re-kindling of one of the original goals of On Landscape, that being the 'Location Guide' . And what a location Bamburgh is! Most of you will no doubt have seen the occasional photo of Bamburgh Castle over the years, especially if you are a visitor of the various social media photography websites; but Bamburgh has more to offer than just a bit of gothic romance.